We arrived in Atkinson on August 6th. This trip was just a little over two hours. It is much easier on us and less tiring for Les when we do a short trip. The trip was pretty uneventful, except for the one turn we missed, but fortunately we had paved roads to get us back on track. We crossed over the Missouri River amidst rolling hills which are always a nice break from the flat fields. We are staying at the Wheels Inn and to say we were a little surprised when we pulled in would be an understatement. We pulled into what we thought was a gravel parking lot, but as we looked around we realized it was camping sites. The look on our faces was pretty funny. The owners were away when we got there but left a note for the "Brandt's" to pick one of the three sites listed. We then discovered that there was also a grassy area as well, thank goodness. We ended up with the only cement pad in the grass section. So a nice level spot. The campground is right on Hwy 20 so there was a little bit of road noise, but not much at night. Jan the owner is a very sweet lady and had lots of suggestions for things to do. There are no amenities on site other than bathrooms and showers. Atkinson is fairly small, they have one restaurant and two grocery stores. There is also a very large specialty gift shop, Marilyn's, that is two floors of rooms filled with knick-knacks, gifts and Christmas items. They have a number of full size Santa's and an interesting bubble bath display. There is also a variety store that has an old time soda fountain in it. As we pulled up they were locking the door, so we left and went to the grocery store where the owner of the variety store saw us and apologized for not being open when we got there. Gotta love small towns. He also was excited when he saw our Reiki sign on our car, he learned Reiki a number of years ago and loves it. We did make it back to the store during business hours and it is filled with anything and everything you can think of. 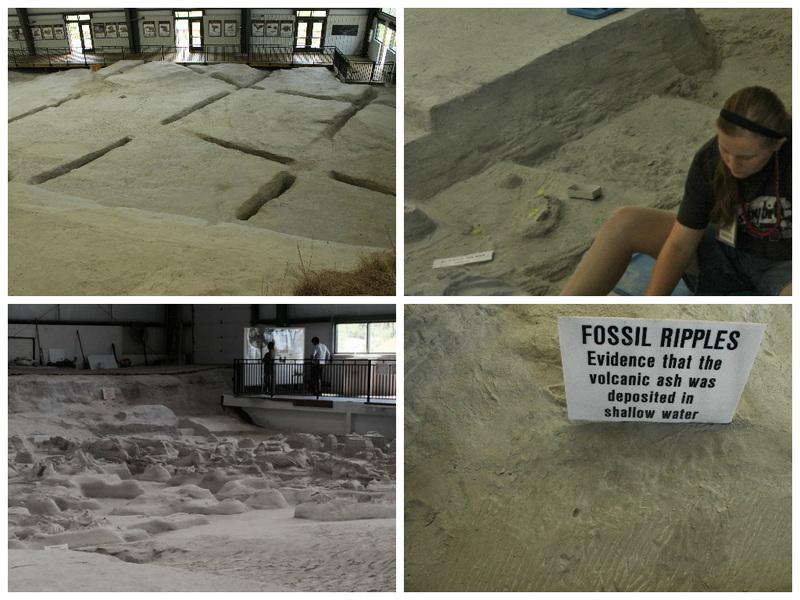 Ashfall Fossil Beds in Royal, NE was really interesting. You enter through a display room that has a large windowed room where you can watch them working with the bones they have found. You follow a sidewalk that is lined with information signs and takes you to the Rhino Bone Barn, which is where the dig is. It is a large building that has been put up over the site so work can be done in inclement weather. This site does not work year round, only during the summer. It was so interesting seeing all the different levels that they have gotten though and what they have found. A volcano erupted in Yellowstone 1.2 million years ago, and the ash spread out to here. One find was a large group of animals that were at a watering hole when they died from the ash. 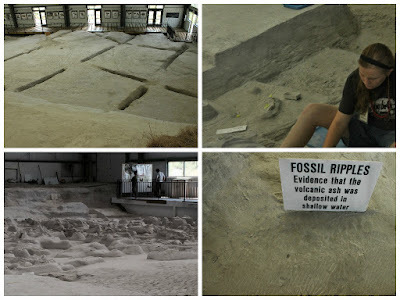 There were students working on the dig the day we were there and they stopped and talked with people as they came through and answered a lot of questions. Can you spot the lizard in this picture? 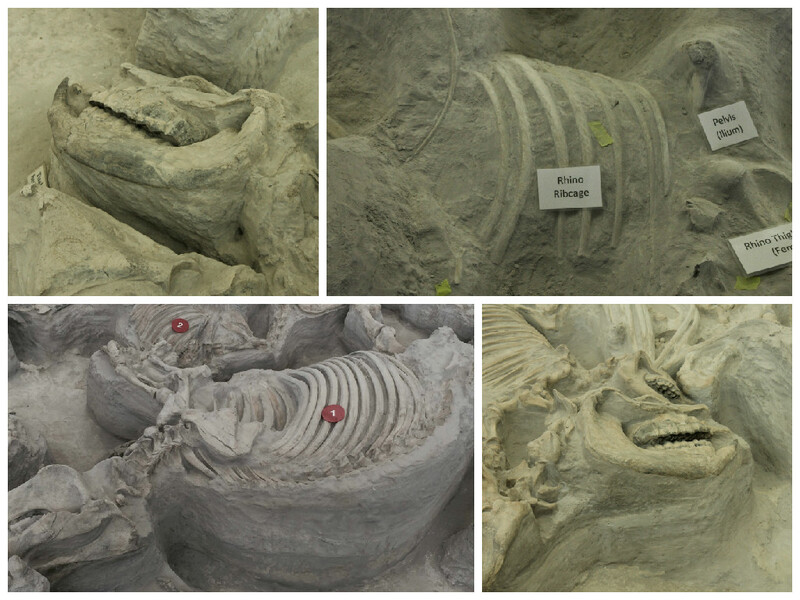 There have been a number of fossils found outside of the building as well. A large tortoise shell, almost intact and a number of other various bones. The set up is really nice and easy to navigate. The entire property is handicap accessible and dog friendly. Sioux City did not impress us as much as some of the other towns we have been in. We did find a nice park that runs along the rivers edge. There is a statue commemorating the rescue of 3-year old Spencer Bailey, from the United Airlines Flight 232 plane crash on July 19, 1989. "The Spirit of Soiuxland"
As we drove through the park we also came across a Lewis and Clark Center, but it had closed just minutes before we got there. We were able to walk the grounds. 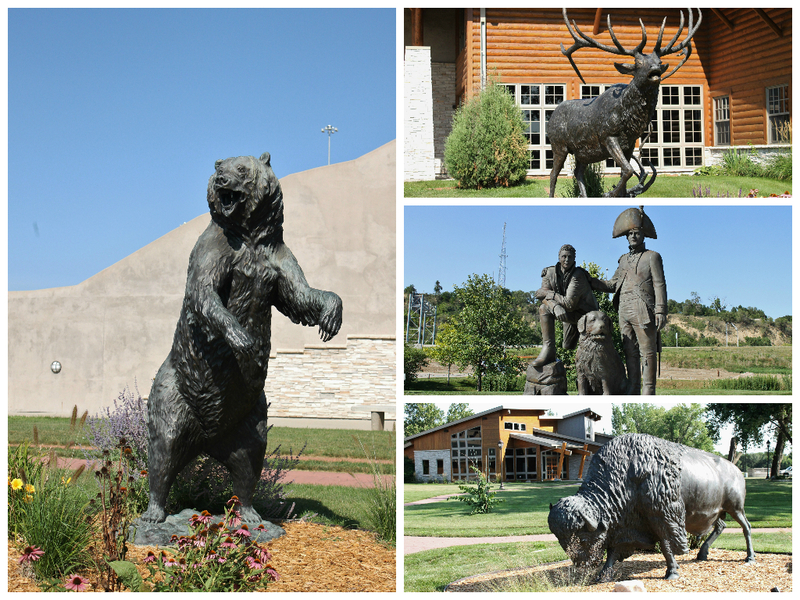 Smith Falls State Park and Fort Niobrara National Wildlife Refuge are in Valentine, NE. Getting to the falls was a fairly east walk, and there is a handicap ramp as well. The day we went was hot and it is a stop on the river tubing tour so there were a ton of people. The falls, are a 70 foot drop over a rock ledge. They are the highest water falls in Nebraska. The 30 mile stretch of the Niobrara River Valley that includes the falls, is often refereed to as the "biological cross roads of the Great Plains. A variety of trees and plants are found here that are not any where else in the state. 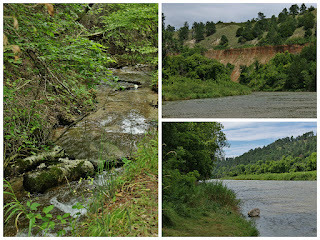 The wildlife refuge is just a short drive from the falls, with overlooks of the refuge along the way. There is a visitors center that has displays and a video you can watch that tells about the fort that once was here. 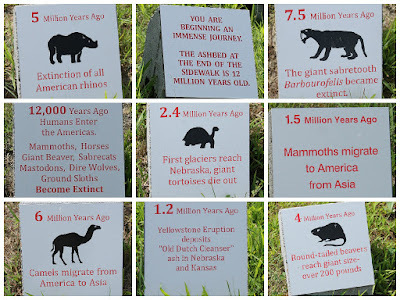 As you drive through the refuge you can follow along with a pamphlet that corresponds with the numbered signs along the route. We saw some bison off in the distance, but once again no elk, they had been spotted earlier but we missed them. We did see a number of prairie dogs. With some of their burrow openings in the middle of the road - it was hard not to see them. That's Les ahead of me on the path. There is also a waterfall on the refuge. To get to it you have to walk down a long flight of open metal stairs that neither Nancy or Mielikki were very fond of. So we took the hiking trail back to the car, it doesn't appear that many people do, as the trail was rather overgrown. Some Roadside Oddities we found along the way. In Plainview, NE we loved that their street signs have pirates on them - it's their school mascot. 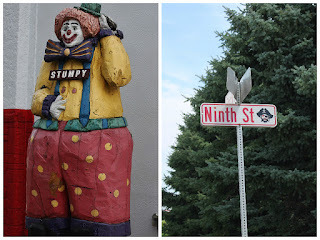 We also found Stumpy the Clown outside of the Klown Doll Museum - from the displays in the window we decided not to go in and check out the creepy clowns. We found another stock car race to attend, actually we found two car races. One was model cars. There is a small dirt track at the park across the street from our campground. This was really fun to watch. The "racers" were all ages, with the youngest being around eight to the oldest in his 40's. The actual stock car races were held in Stuart, NE, just a few miles away. It is a 1/3 of a mile dirt track and there were six types of cars racing. The track has been operating for 63 years and it is in a city park. Of course, this means there is no alcohol which is very strange for a race. Tiffany Bittner from Hampton, NE won the Hobby Stock, it was nice to see a woman win. gave us quite the light show. When we heard that O'Neil was the "Irish Capitol of Nebraska" we got pretty excited. Well, that was until we got there. Pretty sad when the best thing you find in a town is it's laundromat. There is hardly anything Irish in town and when we went to the Blarney Stone for dinner, there was nothing Irish on the menu, and the food we did order was terrible. We eat out very seldom and the last two times were awful, hoping this is not a trend. ~ When you have very little room in your freezer you need to create extra space. A small shelf gives you space below and by using two plastic containers on the shelf it gives you ample space for frozen veggies and meat. Plus, everything stays put without slipping and sliding while on the move. ~ Our freezer is not self-defrosting. We found that we could defrost it while traveling to our next stop. We emptied the freezer contents into the fridge along with all of our freezer packs. We attached a bungee cord from the freezer door to the handle of the cupboard next to it so it would stay open and not bang around while driving. A towel laid on the bottom of the freezer catches the water, and when we arrived we simply wiped out the freezer, restocked it and turned it back on.